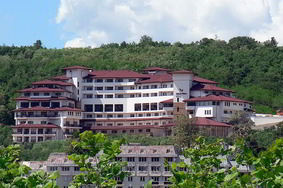 Location: “Kalina Palace” hotel is located at 15 “Panorama” street in Tryavna town. Accommodation: The hotel offers 122 comfortable double rooms, 10 superior rooms, 10 studios and 5 suites. The rooms are equipped with mini bar, telephone, safe deposit box, WiFi internet connection, television and air-conditioning. Wine & Dine: In the hotel there is a restaurant with 250 seats and a lobby bar. Hotel amenities: For your comfort the hotel offers a swimming pool, room service, laundry and ironing, parking lot and garage. Conference halls: For the needs of business tourism, the hotel offers 4 multifunctional conference halls. All of them are day-lighted and have air-conditionings and sound systems.